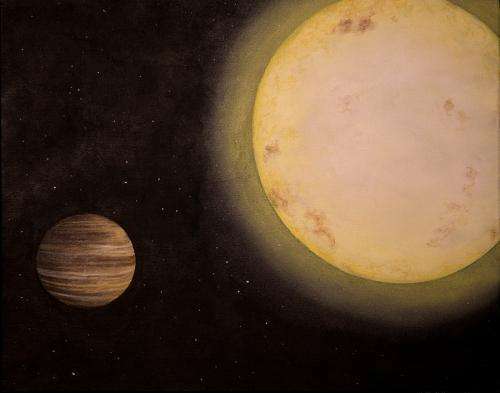 Astronomers caught sight of the planet when it passed in front of, or "transited," its host star—and they've since discovered that the planet resembles one of the most famous and well-studied transiting planets, HD 209458b. Five hours may seem like a short time, but most planets found by ground-based telescopes have even shorter orbits. So catching a complete observation of KELT-6b took more patience and substantially more luck than usual – a total of seven hours of continuous telescope time with clear skies during darkness. Collins had clear skies on both of her only two opportunities to catch the planet earlier this year at UofL's Moore Observatory. Collins and her team determined that KELT-6b is a hot gas-giant planet orbiting a star about the same age as our sun. The planet resembles our own Saturn in terms of size and mass, though it has no rings. It also resembles the most studied exoplanet to date, HD 209458b, but differs because it was formed in an environment low in metals—that is, elements heavier than hydrogen and helium.